Kyle Howard wears navy blue high top Converse “Chuck Taylor” All Stars in the film. Grover and Amy successfuly lock up their parents in the basement. House Arrest introduces us to the Beindorf family consisting of young brother Grover (Kyle Howard), sister Stacy (Amy Sakasitz), and their parents Janet (Jamie Lee Curtis) and Ned (Kevin Pollak). The Beindorf family seems to be a loving and happy family based on the actions of the two kids. For Janet and Ned’s eighteenth wedding anniversay, Grover and Stacy have put together a home video celebration of their life together, including film from their wedding and honeymoon and clips from when the two kids were little. Unfortunately, this wonderful tribute blows up in their faces because Ned and Janet have chosen this day to announce their separation. The two kids are devastated by the news and are fearful for their future. 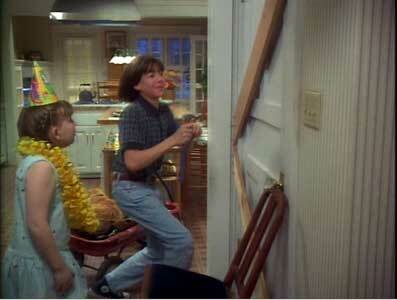 Grover’s best friend Matt (Mooky Arizona) warns him that once the separation actually occurs, divorce is inevitable. The kids decide to take things into their own hands, and invite their parents down into the basement for an anniversary party. Instead of enjoying themselves and having a good time (at least for the kids), Janet and Ned immediately staring arguing with each other about the fact that their plans to remodel the basement have now taken fourteen years and the project is still not near completion. But Grover and Stacy have drastic action in mind, and while the two adults are bickering with each other, they lock all the doors and windows and nail up barricades. 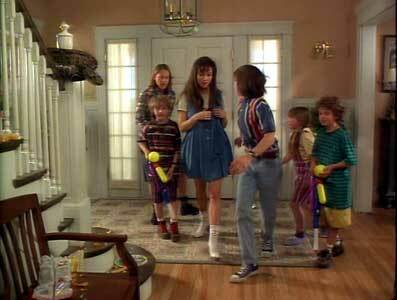 Suddenly prisoners in their own home, Janet and Ned yell at the two kids to let them go this minute, but to no avail. They are told that they will stay locked up in the basement until they learn to get along. Soon several sets of parents are kept prisoner in the cellar of the Beindorf house. Word of what Grover has done soon gets around school. Grover, seen as a nerd and sometimes bullied by T.J. Krupp (Russell Harper) and his friends suddenly has new found respect among the other students. In fact they think it is such a good idea that they want to participate themselves. Matt brings over his often married and divorced father (Shawn Wallace) — maybe due to his bad jokes — and chain-smoking mother (Caroline Aaron), T.J. brings over his philandering father (Christopher McDonald) and abused mother (Sheila McCarthy), and Brooke (Jennifer Love Hewitt) the prettiest girl in class brings over her yet to grow up mom (Jennifer Tilly) who still dresses and acts like a teenager. So now the Beindorf basement is filled with seven arguing adults trying to figure out how to escape while upstairs the kids, suddenly free of all adult supervision, begin to have a big party. With kids and pets running wild through the house, Grover realizes that he has lost control of what his original plan was and decides that he must re-take charge, as already one nosy neighbor (Ray Walston) seems suspicious of what is going on. Will the actions of Grover and his friends bring their parents to their senses? Or will they just get into worse family situations when the parents finally escape? The answers to these questions make up the remainder of the story line. The kids lure Brooke’s mom into the the cellar. With its paper thin plot and simple story line, House Arrest must rely on the performances of the actors to give it some personality. Collectively, Kyle Howard, Jamie Lee Curtis, Kevin Pollak and Amy Sakasitz seem to be such nice people, you wonder what got them into trouble in the first place. If things were at a crisis point in the Beindorf household, why are the kids so devoted and caring? Wouldn’t normal nice parents consider marriage counseling on their own before being forced to look at their problems because they are locked in the basement? As is usual in family comedies of this type, the actions of the kids often make more sense than those of the adults. And the adults tend to act more like kids in their decision making and inability to escape from their predicament. While most of the other characters don’t have much of a chance to be more than a stereotype, we do see development in Kyle Howard’s character Grover throughout the film, and that he begins to earn the admiration of his peers well-played by Jennifer Love Hewitt, Mooky Arizona, and Russell Harper. Of the other parents, Jennifer Tilly puts in the best cameo in her role as the parent who doesn’t want to grow up. House Arrest has the weight of a half hour situation comedy but the length of a feature film. The plot situation would lend itself to some interesting dialogue and much more character interaction, but screenwriter Michael Hitchcock and director Harry Winer chose to keep things predictable and sentimental. 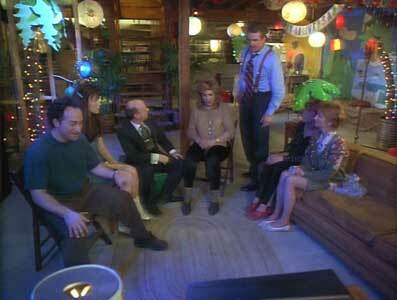 So House Arrest ends up being a “check your brain at the door” family comedy that doesn’t take itself too seriously. After things get out of hand, Grover decides that he must take charge again. Grover is dumped into the trash container by T.J. and his friends. 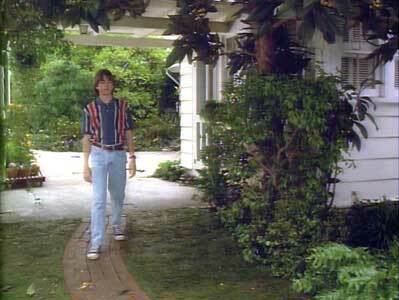 Kyle Howard in his role as Grover Beindorf wears navy blue high top chucks throughout House Arrest. 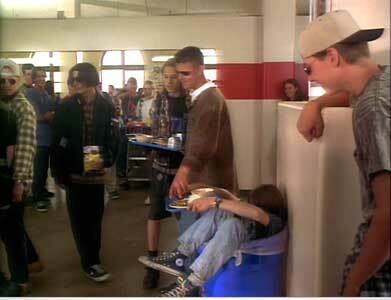 There are a number of scenes in the film where you notice them, but probably the best closeups occur in the school cafeteria scene where poor Grover is dumped into a blue plastic trash can by some of the school bullies. 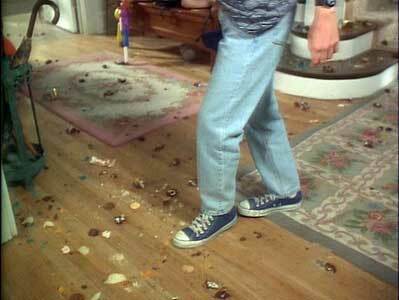 Grover walks gingerly through the mess left by the other kids. House Arrest. (1996) Kyle Howard, Russel Harper, Jamie Lee Curtis, Kevin Pollak, Amy Sakasitz, Wallace Shaun, Jennifer Love Hewitt, Jennifer Tilly, Mooky Arizona, Caroline Aaron, Christopher McDonald, Sheila McCarthy. Directed by Harry Winer. Categories: Comedy, Family.